The Charles H. Scott Gallery is pleased to present Virtual Voices an exhibition of Chinese artists who utilize social media as a platform for their art practices. The internet has become the people’s cyber discipline committee in China because it encourages members of socially excluded communities to use their virtual voices. Dissidence and public critique has become more covert pushing citizens to become netizens expressing their opinions via the internet. Social media such as Weibo, Facebook and personal Blogs have given a new voice to the contemporary art scene in China. 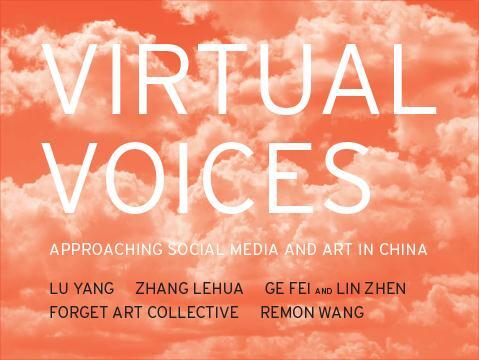 Virtual Voices presents works by Lu Yang, Zhang Lehua, Ge Fei and Lin Zhen, Forget Art Collective and Remon Wang. The exhibition explores how meaning is communicated through social media today, from different perspectives and approaches. Lu Yang examines communication technology and the growth of artificial intelligence. Zhang Lehua’s Facebook is a video narrated by an animated portal of Friedrich Engles instructing students on how to create a flipbook of faces with their classmate. The end result is a government approved and endorsed “Facebook”. Ge Fei and Lin Zhen commissioned two Beijing bands to compose music which they make it available to visitors via an online music sharing application. Forget Art Collective established a series of programs to challenge both social and spatial constructions in China. The Youth Apartment Exchange Program (YAEP), encourages the temporary swapping of residences. Remon Wang has 100,000 followers on his Weibo account where he posts comic illustrations commenting on national and local politics. Regulators have closed his Weibo account more than one hundred times, but have not stopped him from re-inventing new ways to get his message across. 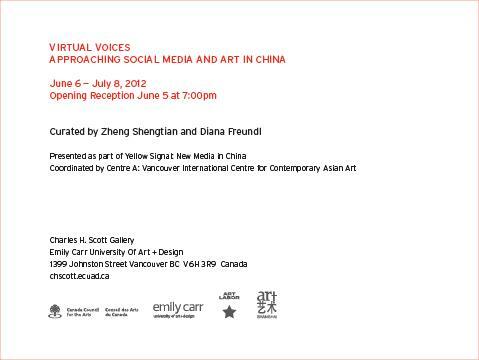 Virtual Voices is part of Yellow Signal: New Media in China a series of exhibitions coordinated by Centre A: Vancouver International Centre for Contemporary Asian Art. Polish director Jerzy Grotowski reduce the medium such as forms and element in drama, and first introduce the word ‘Poor Theater’ into the culture terms of 1960s. Today, what has been left to do in the theater after theater? Perhaps the purest theater only exists in ‘Found Situation’, which merges forms into forms, concepts into concepts, things into things, situation into situation, and eventually merges lives into lives. ‘Guerrilla’ emphasizes the process. During the process, time and memory interlaces to look for the next location and control everything to unfold in medium. Andreas Sell was born in 1977 in Bayreuth/Germany. Currently he´s living in Berlin and Beijing. Before he started studying fine arts, he absolved a four years actor´s training at the Studiobühne Bayreuth and a three years apprenticeship as stonemason/stonesculptor. 2008 he graduated from the School of Art and Design Berlin Weißensee with the major sculpture. In 2006 he received an annual scholarship from the German Academic Exchange Service (DAAD) to continue his studies in the MFA program in New Forms at Pratt Institute NYC. By developing subversive action plans he intervened in different exhibition contexts, amongst others in Berlin at the Hamburger Bahnhof, the Old Museum, Bodemuseum, Pergamonmuseum, the Old National Gallery and during the 5th Berlin Biennale at KW Institute for Contemporary Art. 2008 he received the Mart Stam Award for most promising young artists of the School of Art and Design Berlin Weißensee. 2009 he received a postgraduate scholarship from the German Academic Exchange Service to continue his artistic work in the People´s Republic China. Working in several different mediums and with a number of collaborators from around the world, New York-based, Swiss artist Katja Loher’s explorations of language and visual form come together in an assemblage of present technologies and dramatic sculptures. Translating, in poetic metaphor, the “ambivalent relationships between power, freedom and dependency,” she creates a powerful visual platform that pulls the viewer out of his current perspective and provides a broader perspective with which to address existential questions and present concerns in the world. A multi-awarded artist, Katja’s video sculptures and installations have appeared at international galleries and institutions. In 2004,Katja Loher was the recipient of the TPC CreaTVty Award from the Swiss TV Production Center. In the last years she received several artist in residences, awards and grants including 6-month artist residencies in Berlin and New York. Michael Yuen’s work encompasses a plurality of media. He is known for a body of works making use of light, sound and performance. Over the past years Michael has divided his time equally between Australia and China, and in both environments his works have investigated the city and public space through events and interventions. His work is often temporary and situated outside engaging directly with the city and is frequently associated with interdisciplinary, public space and media practices. Michael has worked with Zendai Museum of Modern Art (Shanghai), Australian Centre for the Moving Image (Melbourne) jointly with the Hayward Gallery (London), Adelaide International Festival of Arts, SSamzie Space (Seoul), Yuanfen New Media Art (Beijing), received Ruby Litchfield and AsiaLink awards. He has served on the InterArts board for the Australia Council of the Arts (2006/7). Michael divides his time between his native Adelaide and Beijing. Ma Yongfeng was born in Shanxi, China in 1971 and is a new media artist currently based in Beijing. He has exhibited widely across Europe, the United States and China – most recently in Chinese Video Now at P.S.1, New York, Becoming Landscape at Platform China, Beijing, and The Cretaceous Period at ArtSway, UK. He was selected for the Production Residency Scheme by ArtSway and Chinese Art Centre in UK from an exceptional shortlist of artists nominated by Chinese curators and professionals in 2007. Ma came to international attention in 2002 with The Swirl, a video depicting six Koi carp being subjected to a 15 minute wash cycle in an upright washing machine. The piece was exhibited at MOCA at Los Angeles and PS1 in New York. Ma has continued to explore additional alternative realities between order and disorder in many of his video, animation, photography and installations.